Mitt Romney is accusing President Obama of having “sold Chrysler to the Italians” in a new ad, building on all the wild charges and allegations that have permeated this presidential campaign with a whiff of xenophobia. That tidbit came packaged with Romney’s utterly fallacious contention that Chrysler’s Jeep subsidiary intends to move production from the key battleground state of Ohio to China. How ridiculous – and how distressing that Romney would try to cover up his own poor record on autos by flinging such absurdities. Here are the facts: Chrysler was not sold to the “Italians.” I know, because I was there when President Obama made the tough – and at the time, politically unpopular – decision to save the auto companies. Chrysler entered into a joint venture with Fiat (which happens to be an Italian company), because we believed that the business fit between the two companies was outstanding. (Fiat had no presence in North America and Chrysler had no presence outside of it) and because Fiat had the kind of world class CEO in Sergio Marchionne that we believed was essential to restoring the company to good health. If Fiat and Mr. Marchionne had not been available, my view would have been that we did not have the essential ingredients to a successful Chrysler rescue. Had the president agreed, the consequence would have been the demise of Chrysler and the loss of hundreds of thousands of jobs. So we should think of Fiat as the savior of Chrysler. Under Mr. Marchionne’s leadership, a nearly dead company – it did not have a single car on Consumer Reports’ recommended list – has been restored to vibrancy. Since 2009, the company has added more than 11,200 jobs in the United States. Sales and market share have increased steadily. Its cars get higher marks from reviewers. Billions are being invested in its plants. It is once again solidly profitable. Yes, Fiat received equity in return for the management and technology it brought to the table, but that equity was earned, and it was a great deal for the American taxpayer. Chrysler was rescued and all but about $1.4 billion of government money was repaid. The notion that Chrysler is planning to move production and jobs from the U.S. to China is equally absurd, particularly given all the investment and hiring that is occurring in America. What Chrysler is contemplating is the same sensible thing that General Motors, Ford and most other auto companies are already doing: Producing Jeeps in China for the local market. We knew when we were mapping out the auto rescue that Jeep was Chrysler’s truly iconic brand, and a piece of what attracted us to Fiat was Fiat’s ability to market that brand worldwide. And that’s what is now happening. Chrysler’s international sales have risen by 22% so far this year, and three quarters of those were Jeeps. In China, Jeep sales have more than doubled in 2012. We should all cheer for Jeep’s global success. These kinds of charges are part of Romney’s effort to obscure and rewrite the history of his views about the auto rescue. Let me emphasize the key point: Starting with his famous 2008 op-ed, “Let Detroit Go Bankrupt,” Romney has been very clear in opposing any government help for the auto companies except possibly after – and I underscore after – bankruptcy. The problem with that approach is that there would have been no “after.” Companies can’t operate without cash. Former president George W. Bush recognized that when he provided $17 billion in bridge loans to GM and Chrysler in late 2008. In both 2008 and 2009, there was no private capital available to allow these companies to keep making cars. 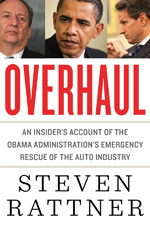 Without President Obama’s help, Chrysler and GM would have stopped making cars, closed their doors, laid off thousands of workers, halted payments to suppliers, and liquidated. The result would have been devastating. Our nation’s auto suppliers would have also had to shut their doors. Ford would have closed, at least temporarily, because you can’t build cars without parts. The foreign transplants, operating mainly in the South, probably would have had the same problem. Independent analysts have estimated that approximately 1.4 million jobs would have been lost. For his part, Mitt Romney still claims that the auto industry would have been better off if President Obama had never intervened. How absurd is that?